The first time I saw this image on Facebook I couldn't share it fast enough. Social media has revolutionized the way animal shelters are able to get the plight of homeless animals to the masses. Nothing warms my heart more than to see that animals have been pulled from kill shelters and placed with rescue groups. Everyday lives are saved because of people blogging, Facebooking, and tweeting about waifs in need of their forever home. 1. Bloggers. Pet bloggers are passionate about rescue work. Scope us out and ask us to write about your shelter prior to an adoption/fundraising event. An adopted pet (such as Truffles!) can "interview" shelter residents looking for a home, or the cat or dog could write up their own little personals ad telling potential adopters about themselves similar to Match.com. A blogger fluent with Photoshop could create cute "Wanted" posters. Share the blog posts on Facebook and Twitter, and email the links to everyone on your mailing list. 2. Reach out to local photographers. My local shelter has a professional photographer volunteer her time each week to come in and snap pictures of the new pets up for adoption. There is nothing sadder than seeing a photo of a scared & lonely homeless pet cowering in the corner of a cage. Show them happy and having fun - the way they'll look once they're in their new home! 3. Video. Most all smart phones today have a video function. Video is so much more powerful than a photo. Attach a short clip of each cat or dog to the pet profiles on your website and Petfinder, or start a Youtube channel. My shelter recently had a 3-legged cat (amputation after being hit by a car), and they put up a Youtube video showing how it hadn't slowed him down one bit - he was playfully bouncing off the walls and it was a joy to see! Orphaned pets can't speak for themselves. We are their only voice. Let's use our social media presence to help find needy pets a home! This is such important information. Social media can help in so many ways! This topic came up the other day- someone thought social media couldn't make a difference for shelter pets and I was very quick to correct them! Next time I can point them here! Thanks! I particularly agree that reaching out to photographers is so important! Pictures of the dog can get it adopted much quicker. Love the video suggestion! :) When animals are given a personality people are more drawn to them. Great tips! Great Post! I couldn't agree more. 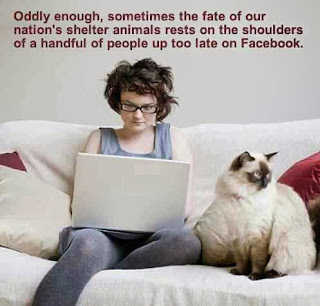 Social media has made a huge difference and has brought the animal rescue community closer together. I take photos of cats, for two local shelters. The staff simply do not have the extra time to do more than a quick snap of a cat in their cage. Once I've had a little 'chat' with the 'cat', they look more like their domesticated selfs, than wild animals in their cage. Thank you for sharing these suggestions. YOU are so spot on with these tips. I know that reaching out to bloggers is such a good thing for shelters to do. We can spread the word in so many ways! Happy BlogPaws Wordless Wednesday! nice to meet you, first time hopper here. i use facebook as my main media to network dogs..animals...in need and post some to my blog and other animal welfare needs. Thanks for sharing those tips, Melissa! Those can be really useful for anyone who wants to share their concern for orphaned animals. Every thought counts. However, it would be greater if this would be performed with actions. We are among the top three companies web positioning Chile, and the only ones with guaranteed results within 30 days, consisting of experts in SEO and SEO positioning, In the last 4 years, we have positioned hundreds of websites on the first page google and can do the same for you. It's still cold here in Minnesota with snow on the ground. Alice, a former Feline Rescue kitty, has found a great way to keep warm.